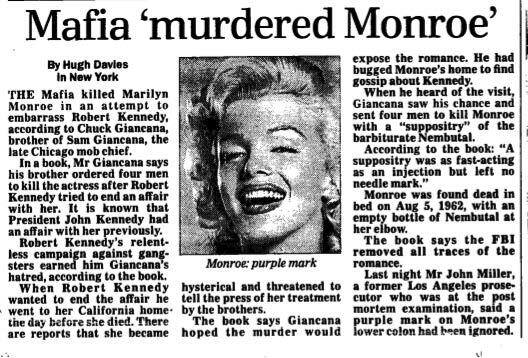 The Mafia killed Marilyn Monroe in an attempt to embarrass Robert Kennedy, according to Chuck Giancana, brother of Sam Giancana, the late Chicago mob Chief. In a book, Mr. Giancana says his brother ordered for men to kill the actress after Robert Kennedy tired to en an affair with her. It is know that President John Kennedy had an affair with her previously. Robert Kennedy’s relentless campaign against gangsters earned him Giancana’s hatred, according to the book. When Robert Kennedy wanted to end the affair he went to her California home the day before she died. There are reports that she became hysterical and threatened to tell the press of her treatment by the brothers. The book says Giancana hoped the murder would expose the romance. He had bugged Monroe’s home to find gossip about Kennedy. When he heard of the visit, Giancana saw his chance and sent four men to kill Monroe with a “suppository” of the barbiturate Nembutal. Monroe was found dead in bed on August 5, 1962, with an empty bottle of Nembutal at her elbow. The book says the FBI removed all traces of the romance. Last night Mr. John Miller, a former Los Angeles prosecutor who was at the post mortem examination, said a purple mark on Monroe’s lower colon had been ignored.